Golden Week is coming. Do you have any plans for the Golden Week holidays? Well. I’m not going to talk about what my plans are. Instead, I want to talk about the word “plan”. Have you noticed that I use the word “plan” in the plural? Plans. a When you talk about what you do with your time, for example, what you’re doing for the weekend or how to celebrate your mother’s birthday, the word “plan” is used in the plural. Let me give you some example sentences. What are your plans for the weekend? Do you have any plans for the summer? I have no plans for the future. 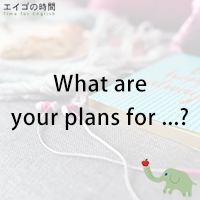 Well, if you happen to speak about Golden Week in English, try to use the question “what are your plans?”. 1. I’m talking about how to use the word “plan”. 2. I’m explaining what Golden Week is. 3. I’m talking about what my plans are for Golden Week.